I wanted to post something about the 1982 invasion and Bashir Gemayel’s election as president, but I couldn’t find anything (If you do find something about the early eighties, please mention it in the comment section). 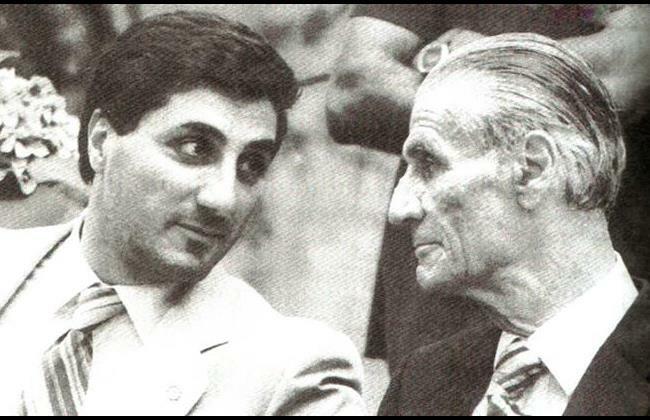 This post is a compilation of four cables mentioning Gemayel in the last months of 1977. The cables are organized chronologically. 2. SARKIS SAID PIERRE HAD CALLED ON HIM YESTERDAY MORNING (NOV 11) AS PROMISED AND ON BEING ASKED, SAID HE HAD NO KNOWLEDGE OF ANY PLANS OF BASHIR TO UNDERTAKE ACTION OF THE SORT PRESIDENT DESCRIBED, WITH OR WITHOUT ISRAELIS. IT WAS UNTHINKABLE THAT BASHIR WOULD DO SOMETHING LIKE THAT WITHOUT FIRST CONSULTING HIM. AFTER CONSULTING HIM HE MIGHT GO AHEAD AND DO IT ANYWAY, BUT HE WOULD CERTAINLY CONSULT FIRST. PRESIDENT OUTLINED TO HIM SERIOUSNESS OF WHAT BASHIR ALLEGEDLY HAD IN MIND — MILITARY ACTION AGAINST SYRIANS TIMED TO COINCIDE WITH INCIDENT IN SOUTH, THUS PROVIDING AN EXCUSE FOR ISRAELIS TO LAND AT JOUNIEH IN ORDER COME TO RESCUE OF CHRISTIANS. TO THINK IN THESE TERMS WHEN AREA WAS MOVING TOWARDS PEACE WAS HEIGHT OF FOLLY. IT WOULD MEAN DESTRUCTION OF LEBANON. 3. SHEIKH PEIRRE HAD SUBSEQUENTLY CALLED HIM ON TELEPHONE TO TELL HIM THAT BASHIR DENIED TOTALLY ANY INVOLVEMENT IN PLANS OF THE NATURE DESCRIBED. HE HAD ARRANGED TO BRING BASHIR THERE THIS AFTERNOON (NOV 12). PRESIDENT HAD CONFRONTED BASHIR WITH FACT THAT INTELLIGENCE SOURCES REPORTED HE WAS PLANNING TO ATTACK SYRIAN TROOPS IN LEBANON IN ORDER GIVE ISRAELIS PRETEXT FOR INTERVENTION, AND THAT HE WAS ALLEGED TO BE IN CLOSE CONTACT WITH ISRAELI INTELLIGENCE AGENTS HERE, WORKING OUT COORDINATED PLANS TO THIS END. BASHIR DENIED ACCUSATION FLATLY. PRESIDENT DID NOT BELIEVE HIM BECAUSE HIS INTELLIGENCE SOURCES WERE CERTAIN OF THEIR INFORMATION. 5. I ASKED IF THERE WAS ANYTHING SPECIAL HE WOULD LIKE AMBASSADOR LEWIS TO CONVEY TO ISRAELIS ON SUBJECT. PRESIDENT SAID NOTHING BEYOND TELLING THEM TO CEASE AND DESIST. 6. COMMENT: HAD BASHIR NOT TALKED TO ME IN SUCH REVOLUTIONARY TERMS LAST WEEK, AND HAD WEIZMAN NOT MADE HIS CRYPTIC REMARK ABOUT THE NORTH, I WOULD BE INCLINED TO THINK THIS WHOLE AFFAIR WAS A MARE’S NEST. THERE IS ENOUGH SMOKE, HOWEVER, SO THAT I SUSPECT SOMETHING IS INDEED GOING ON. JUST WHAT AND HOW SERIOUS IS HARD TO SAY. WE HAVE BEEN TOLD, FOR INSTANCE, THAT BASHIR’S PLANS INCLUDE SURROUNDING THE PRESIDENTIAL PALACE AT BAABDA AND MOUNTING A COUP D’ETAT, THE MINISTERS OF THE NEW GOVERNMENT ALREADY HAVING BEEN CHOSEN. THIS SEEMS PRETTY FAR-FETCHED, BUT THERE ARE MANY YOUNG CHRISTIAN HOTHEADS WHO WOULD GO FOR SUCH AN ADVENTURE. REASON TO CLAIM THAT I HAVE SQUEALED ON HIM. WE MAY BE SURE THAT ISRAELIS WILL TELL HIM OF LEWIS’S CONVERSATION WITH WEIZMAN, AS THEY ALSO TOLD HIM WE HAD VETOED ATTACK ON NAQURA. REQUEST THAT WEIZMAN OR BEGIN NOT BE GIVEN COPY OF EITHER OF OUR TELEGRAMS ON SUBJECT. THIS PROMISES TO BE A DELICATE MATTER HERE. 1. APPRECIATE PERSONAL INTEREST YOU TAKING IN ARRANGEMENTS FOR BASHIR GEMAYEL AND AGREE IMPORTANT THING IS THAT USG TAKE CONSISTENT, FIRM POSITION WITH HIM. QUESTION BEFORE US, IT SEEMS TO ME, IS HOW MUCH HE DOES UNDER OUR AUSPICES AND HOW MUCH IS DONE PRIVATELY BY MARONITE COMMUNITY AND ITS OUTRIDERS. LIKELY TO BE MISUNDERSTOOD HERE. THAT IS WHY I WOULD RATHER NOT HAVE JANDA PRESENT DURING BACHIR’S CALL ON YOU. JANKA’S PRESENCE AT LUNCH, A LESSER OCCASION, WOULD CAUSE FEWER PROBLEMS. 3. AS FOR “DEBRIEFING,” I DON’T THINK THERE WAS ANY MISUNDERSTANDING. DEPARTMENT APPARENTLY HAS IN MIND BASHIR SITTING IN SAME ROOM WITH INTELLIGENCE ANALYSTS WHO ASK QUESTIONS AND LISTEN TO HIM. THAT IS WHAT HAPPENS TO ME WHEN I GET DEBRIEFED, AND THAT IS WHAT I ASSUMED WE HAD IN MIND FOR BASHIR. MY PROBLEM IS THAT THIS WILL BE REPLAYED HERE WITH CAPITAL LETTERS–BASHIR GIVES INTELLIGENCE COMMUNITY THE STRAIGHT STORY. THIS GIVES FURTHER CREDENCE TO HIS SELF IMAGE AS PALADIN OF THE CHRISTIAN FORCES SUPPORTED BY THE ENLIGHTENED POWERS OF WASHINGTON IF NOT BY THE AMERICAN AMBASSADOR IN BEIRUT. PUT THAT THROUGH THE LOCAL AMPLIFYING SYSTEM AND IT IS LIKELY TO COME OUT AS A CONSIDERABLE BOOST TO HIS POSITION. HE IS FEISTY ENOUGH AS IT IS. PLEASE DO CALL OFF THE DEBRIEFING, UNLESS I WOULD BE EMBARRASSING TO DO SO THIS LATE IN THE GAME. ANYTHING WE NEED TO HAVE FROM BASHIR WE CAN PROBABLY GET FROM ONE-TO-ONE CONVERSATIONS. 4. WE HAVE NO FEARS ABOUT QUANDT MEETING BASHIR. JUST WANT TO BE SURE FORMER KNOWS HOW IT WILL BE REPLAYED HERE. MAY HAVE BEEN THE WRONG WORD TO DESCRIBE THE SESSION WE ENVISAGE AFTER LUNCH ON DECEMBER 5. WE EXPECT HIM TO BRIEF US, NOT THE REVERSE. BY THEN, HAVING SEEN HABIB, HE WILL NOT HAVE ANY ILLUSIONS LEFT ANYWAY. WE CAN CALL IT OFF IF YOU THINK IT NECESSARY. HIS ADVANCE MAN HAS SAID HE WILL BE READY TO TALK FRANKLY ABOUT THE ISRAELI CONNECTION, AND WE WANT TO HEAR WHAT HE HAS TO SAY. AS FOR QUANDT, HE SAW BOTH CHAMOUNS, AND RUNS ACROSS LEBANESE OF ALL KINDS REGULARLY. 2. WE WILL SEND YOU A REPORT BY CABLE AFTER THE VISIT WHICH YOU WILL BE ABLE TO USE TO BRIEF BOUTROS. 1. IN HABIB’S ABSENCE ATHERTON MET WITH BASHIR GEMAYEL AND ALFRED MADY OF THE KATA’IB POLITBURO DECEMBER 3 FOR OVER HOUR, AND VELIOTES HOSTED LENGTHY INFORMAL LUNCH FOR HIM ON THE EIGHTH FLOOR DECEMBER 5 ALSO ATTENDED BY DRAPER, STODDARD, HOWELL, AND POPE (NO DOD OR CIA REPS WERE THERE). “NUANCES” TO THIS POSITION. HE WANTED A UNITED LEBANON. AT THE SAME TIME, HE WAS OPPOSED TO A RETURN TO THE BANKRUPT STATUS QUO ANTE OF THE NATIONAL PACT. HE WAS VAGUE ABOUT IDEAS FOR SPECIFIC POLITICAL REFORM, WHICH HE ADMITTED HAD YET TO BE WORKED OUT, BUT SAID THAT SOME SORT OF “DECENTRAL- IZATION” WAS NECESSARY TO PREVENT DE JURE PARTITION. DE FACTO PARTITION ALREADY EXISTS. REFORM WOULD HAVE TO BE RADICAL. THERE WAS NO POINT IN GOING BACK TO THE OLD SYS- TEM OF MEDIOCRITY AND COMPROMISE. A NEW SYSTEM, HE SAID, SHOULD OFFER “EQUAL OPPORTUNITIES” BUT DEMAND “EQUAL OBLIGA- TIONS” BY ALL THOSE READY TO PUT LEBANON FIRST. SUCH NECES- SARY CHANGES SHOULD HAVE BEEN MADE MONTHS AGO BY SARKIS. NOW THE GAP BETWEEN FACTIONS WAS WIDER THAN EVER, AND HE WAS AFRAID REFORM MIGHT COME TOO LATE. HE WAS CRITICAL OF SARKIS FOR TRYING TO PERPETUATE THE STRONG, CENTRAL GOVERNMENT CONCEPT, WITH ITS CHEHABIST PHILOSOPHY, G-2 TRAPPINGS, ETC. PRESSED REPEATEDLY TO BE MORE SPECIFIC, HE RETREATED TO PHRASES SUCH AS “ALLOWING DIVERSITY TO THRIVE WITHIN A UNIFIED STATE”. HE ADMITTED THAT LEBANON’S FAILURE TO DEVELOP AN ADEQUATE NATIONAL EDUCATIONAL SYSTEM WAS A DISGRACE. UNDER HIS DECENTRALIZED STATE, THERE WOULD, THEREFORE, BE A PLACE FOR A STRONG EDUCATION MINIS- TRY IN THE OTHERWISE RATHER WEAK CENTRAL GOVERNMENT. HE ASKED FOR U.S. SUPPORT FOR SUCH REFORMS. MINDED OR SUPPORTIVE ABOUT THE CONCEPT, IF RPT IF IT EN- JOYED BROAD SUPPORT NATIONALLY. 4. GEMAYEL’S CRITICISMS OF THE POLITICAL STRUCTURE ALSO APPLIED TO A NATIONAL ARMY. HE WAS NOT SO MUCH AGAINST THE BUILDING OF THE ARMY AS HE WAS AGAINST THE OUTDATED PHILOSOPHY WHICH WOULD AFFECT ITS EMPLOYMENT I.E. AS AN INSTRUMENT OF THE CENTRAL GOVERNMENT. IT WOULD REPEAT THE MISTAKES OF THE PAST. CITING PAST OCCASIONS WHEN THE ARMY HAD FAILED TO PROTECT THE CHRISTIAN COMMUNITY, THANKS TO THE OBSOLETE “SYSTEM”, HE ARGUED THAT THE VARIOUS COMMUNITIES COULD NOT BE EXPECTED TO RELY ON ANY NEW ARMY FOR PROTECTION. THE MAIN FUTURE PROBLEM FOR THE CHRISTIANS IS SURVIVAL. WE DO NOT WANT ANOTHER ARMAGEDDON. 5. THE ONE POINT HE WAS CLEAR ON WAS THAT DECENTRALIZATION MUST INVOLVE THE ESTABLISHMENT OF REGIONAL MILITARY UNITS ALONG CONFESSIONAL LINES, ALTHOUGH THEY COULD BE NOMINALLY UNDER A UNIFIED COMMAND. HE WAS SCORNFUL OF PRESENT ATTEMPTS TO REBUILD THE ARMY, AND OUR ROLE, AND CHALLENGED US TO POINT TO ANY EVIDENCE THAT IT EVEN EXISTED, MUCH LESS THAT IT COULD PLAY AN EFFECTIVE ROLE. IT WAS FOR SHOW ONLY, HE ARGUED. HE HAD SOME CONFIDENCE IN KHOURY, BUT UNLESS HE WERE ALLOWED TO BUILD SEPARATE CONFESSIONAL FORCES AS A FIRST STEP HE WOULD NOT SUCCEED. SOUTH, BUT THE UPSHOT OF HIS REMARKS WAS THAT HE PREFERRED THE STATUS QUO TO SHTAURA. WE MADE ESPECIALLY CLEAR THAT WE HAD OUR OWN INTERESTS TO CONSIDER AND WOULD DO OUR BEST TO SEE THAT PALESTINIAN WITHDRAWALS OCCURRED. 7. IT MAY BE OF INTEREST THAT AT ONE POINT WHEN WE HELD UP THE EXAMPLE OF THE PNL HANDING OVER ITS SHERMANS TO THE ARMY, GEMAYEL SAID THAT HE HAD TALKED TO CAMILLE CHAMOUN ONLY AN HOUR OR SO BEFORE TO CHECK THIS VERY POINT (WHICH CAPTAIN NEHME HAD ALSO MENTIONED TO HIM) AND CHAMOUN HAD DENIED VEHEMENTLY THAT ANY TRANSFER HAD OCCURRED. IN FACT, SAID GEMAYEL, CHAMOUN HAD TOLD HIM THAT IF HE COULD GET MORE TANKS FROM THE AMERICANS HE OUGHT TO BRING SOME BACK. WE PRESUME THIS CONFLICT REFLECTS A LACK OF COMMUNICATION BETWEEN DANY AND CAMILLE CHAMOUN, AS WELL AS PNL-KATA’IB RIVALRY. 8. WE BARELY TOUCHED ISRAELI-MARONITE COOPERATION. WHILE SUSPICIOUS OF SYRIAN INTENTIONS, HE ADMITTED THAT THE ADF HAD CAUSED FEWER PROBLEMS AND FRICTIONS THAN ANTICIPATED. HE, LIKE HIS FATHER, HAD CONFIDENCE IN ASSAD, BUT NOT NECESSARILY HIS SUBORDINATES OR SYRIAN AGENTS IN LEBANON. IT WAS A GREAT TEMPTATION FOR THE SYRIANS TO MEDDLE POLI- TICALLY IN LEBANON AND USE THE THREAT OF JAILING THOSE WHO OPPOSED SYRIAN ACTIONS. HE ASSERTED THAT CERTAIN LEBANESE GOVERNMENT ACTIONS AND APPOINTMENTS WERE BEING MADE TAKING INTO ACCOUNT THE SYRIAN FACTOR. WITHOUT HIDING HIS DE- TESTATION OF THE PALESTINIANS, HE HAD NO QUICK ANSWERS TO THIS PROBLEM, AND DIDN’T ARGUE WITH OUR POSITION THAT THE BASIC SOLUTION HAD TO BE FOUND IN A COMPREHENSIVE MIDDLE EAST SETTLEMENT. TO PRESENT HIS IDEAS FULLY AND TO ASK FOR U.S. SUPPORT FOR POLITICAL REFORM. IN TURN, HE RECEIVED A FULL EX- PLANATION OF U.S. ATTITUDES IN CANDID SPIRITED EXCHANGES. HE WAS EXASPERATING IN HIS TENDENCY TO OUTLINE IN EXHAUST- ING DETAIL THE FULL RANGE OF NEGATIVE FACTORS SURROUNDING AN ISSUE WITHOUT PROPOSING SPECIFIC ALTERNATIVES. 10. IN BACKGROUNDING THE LOCAL AN-NAHAR CORRESPONDENT ON GEMAYEL’S CALL ON ATHERTON, WE SAID THAT IT IS USUAL FOR ATHERTON TO MEET WITH PROMINENT VISITORS FROM THE AREA AND TO HEAR THEIR VIEWS, AND THAT NO MORE SHOULD BE READ INTO THE CALL.